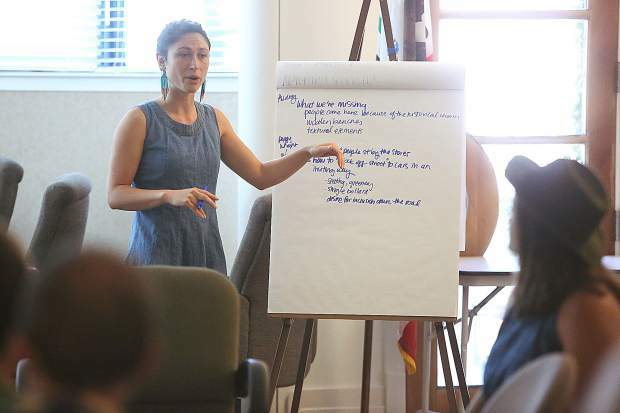 Future Of Nevada County's Bethany Celio takes down notes during the town hall on open spaces Tuesday morning at Nevada City Hall's council chambers. 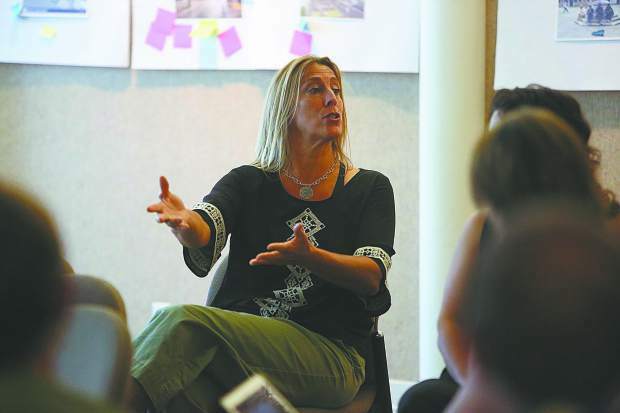 Topics, such as designating parts of Commercial street as pedestrian only, were discussed. Hanging flower planters decorate the sidewalks of Commercial Street in downtown Nevada City where the city is currently exploring turning this stretch of street into pedestrian only. 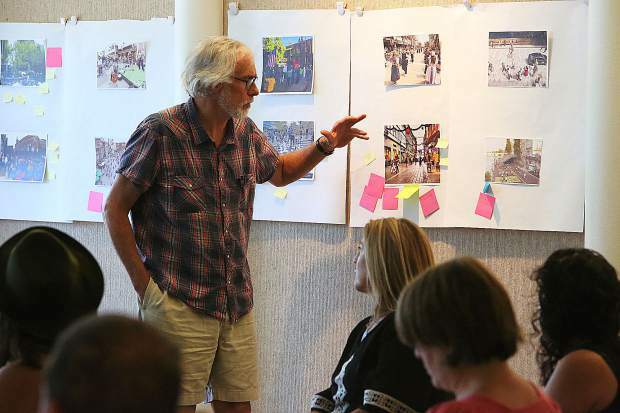 Photos of different types of open public spaces filled the walls of Nevada City Hall, where attendees of Tuesday's open spaces town hall meeting could comment on them. 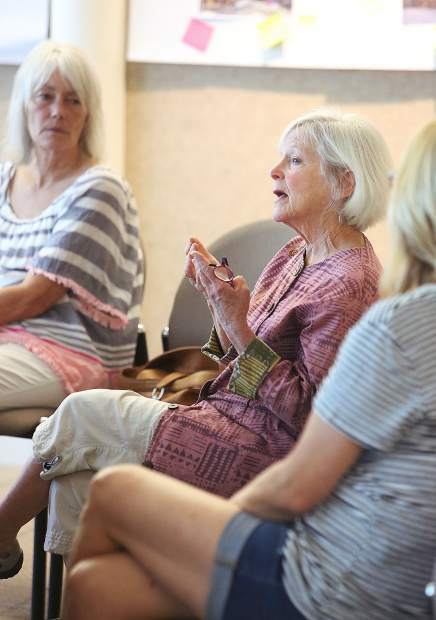 Nevada City vice mayor Reinette Senum gives some input during Tuesday's open spaces town hall meeting. Roughly 25 members of the public attended Tuesday's town hall meeting, giving their opinions about different public spaces topics. A couple of women walk down Commercial Street Tuesday morning. A boardwalk and terrazzo lights have been added to this portion of Commercial Street to make the area more pedestrian friendly. The city is making considering making the area more pedestrian oriented by closing this section of street off to vehicles. Local architect Chuck Durrett gives his input on the public spaces ides brought up during Tuesday morning's town hall meeting in Nevada City. Treats of Nevada City co-owner Peggy Wright talks about downtown events that help and hinder downtown storefront owners. For more information or to share your opinion through the online survey (one for merchants and one for residents/community members) go to FoNC’s website. To get on the mailing list, email hey.fonc@gmail.com. 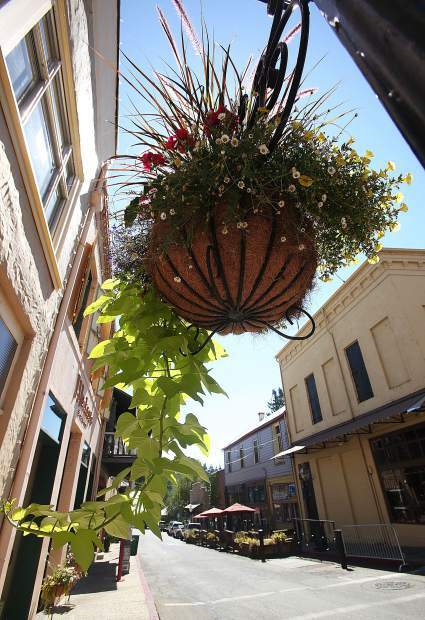 A partial closure of lower Commercial Street in downtown Nevada City could be a reality by next year, as community input is being gathered for a proposal to go before the City Council in October. Other options also are being explored, including turning Commercial Street — approximately between the Three Forks parking lot and Pine Street — into a one-way street or only closing that stretch during certain times of certain days. 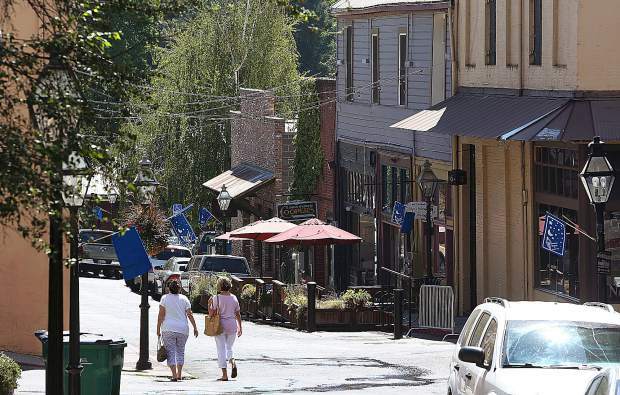 The push toward creating a pedestrian-friendly — or “pedestrian-priority” — space within the core of Nevada City is the brainchild of Future of Nevada County. 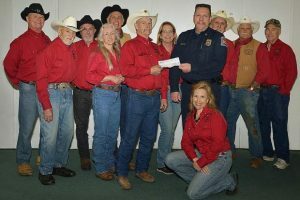 The organization kicked off the discussion last November, with a fundraising concert and panel that included representatives from Nevada City’s police department and City Council as well as a local architect and homeless advocates. In June, the group hosted a discussion that honed in on York Street and lower Commercial Street as two potential sites for a “town square.” Participants discussed potential amenities as well as concerns with traffic, accessibility and safety. 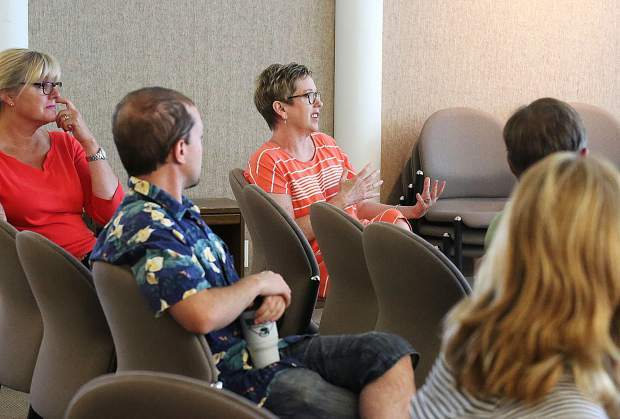 On Tuesday, Future of Nevada County organizers hosted a second workshop that aimed to get more input from local merchants, especially those who might be affected by a street closure. Surveys were hand-delivered to Nevada City merchants and the group has received 21 responses so far. Slightly more than half of those were in favor of a street closure, with most advocating for Commercial Street. Most were in favor of a full street closure. Amenities that were important included greenery, seating and tables, as well as shade umbrellas. Drinking fountains, bike racks and performances spaces were also listed as desirable, as was an element honoring indigenous people. Nearly 60 community residents also responded to the survey, with similar results. 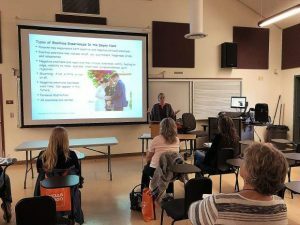 Values such as aesthetics, inclusivity and community were emphasized, all part of keeping the “connected small-town charm” that makes Nevada City special, organizers said. Commercial Street, they said, makes sense as the best space because it already is a narrow street with a boardwalk, and natural “over-flow” from the sidewalks onto the street. Nevada City already is planning a temporary closure of the street this fall, for infrastructure work. City Engineer Bryan McAlister said the sewer and water lines beneath Commercial Street are slated to be replaced. If there is consensus on what people want the street to look like, the work needed could be done the following spring, he said. McAlister noted that city staff would prefer to make Commercial Street one way and keep it open. Nevada City council member Reinette Senum suggested narrowing the street with wider sidewalks as one option to consider. 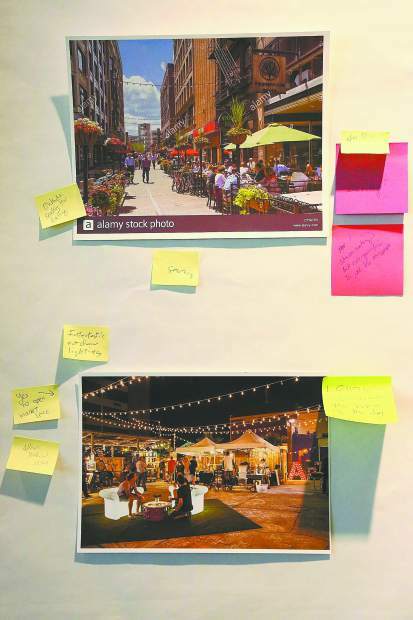 During a visioning exercise, community members highlighted which of a number of photos they liked best, with the most responses going to amenities such as shade, seating, greenery and terrazo-style lighting. “What thrills me the most is where you see people talking to each other” said architect Charles Durrett. Durrett noted that in Denmark, one street closure experiment caused commerce to increase “overnight.” He added that lower Commercial Street is ideal for this because it already has the scale of an outdoor room. 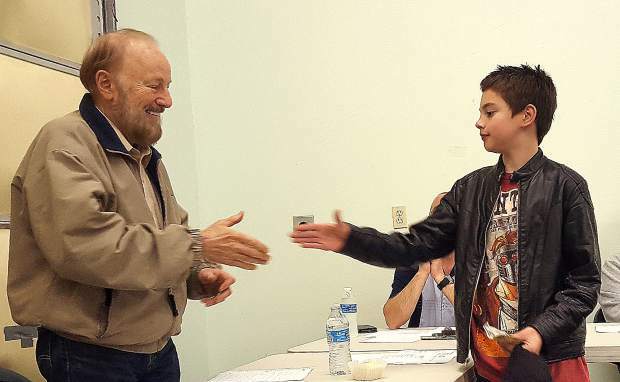 Some of the discussion centered around possibilities that included a cellphone-free “Nevada City Unplugged” event, and concerns over hurting the neighboring businesses. 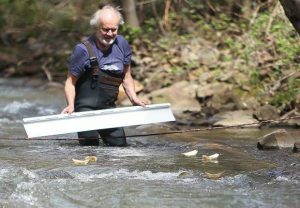 Future of Nevada County intends to continue gathering input and present a proposal to the City Council. If the council signs off on a street closure, the organization said it would then put a request for proposals out for a landscape architect. The group also is looking to create a spin-off group potentially called “Friends of Commercial Street” that would take on clean-up, maintenance and conflict resolution duties for the space.